Ireland’s funniest lady returns this Christmas Season with the 2014 June Rodgers Christmas Show on the Red Cow Moran Hotel stage. 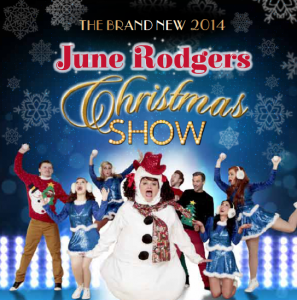 June Rodgers, brings her stunning Christmas Cabaret to the Red Cow Moran Hotel. In the New Year the show moves to the Silver Springs Moran Hotel for two special performances on Friday 2nd and Saturday 3rd January. June has created yet another brand new show for your entertainment and delight. This year’s show includes some great music from the 90’s, including, The Spice Girls, Take That, Boyzone, Britney Spears and Kylie as you have never seen her before! This is one of the best Christmas Party Nights that Dublin and Cork will see this Christmas! 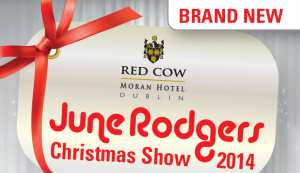 The June Rodgers Show will be coming to the Red Cow Moran Hotel on Friday 28th November until Monday 29th December 2014 – Make sure to book your night now! This year June will be revealing some fantastic new characters that will have everyone laughing in the aisles! 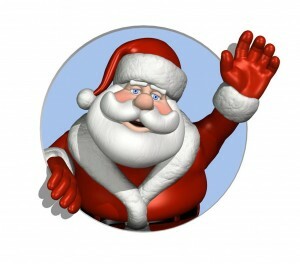 This is one of the best Christmas Party Nights that Dublin and Cork will see this Christmas! The June Rodgers Show will be coming to the Red Cow Moran Hotel on Friday 30th November until Tuesday 1st January 2013 – Make sure to book your night now! The hilarious June Rodgers Christmas show is currently on in the Red Cow Moran Hotel and will be moving to the Silver Springs Moran Hotel Cork for their little Christmas shows. 2 tickets to the June Rodgers Show including dinner – in Dublin or Cork, the winners choice!! Question: What does June Rodgers reckon Tallafornia Girls like to have on their chips???? To be in with a chance of winning this Christmas Cracker of a prize get your answers in by Wednesday 14th of December, winner will be announced on Thursday 15th!! Don’t forget you must be a fan of ours on facebook!! June Rodgers was out in style at the weekend….she decided to pop into Liffey Valley Shopping Centre to give the guys there a sneak preview of her brand new Christmas Show!! The busy Christmas shoppers didn’t know what was going on when June appeared out of nowhere dressed as a Christmas tree followed by a gang of dancers. They gave a fantastic performance of June’s very special cover of Katy Perry’s California Girls – “Tallaghfornia Girls“!! Check out the full Flash Mob performance below!! If you want to see this song and much more from the hilarious June Rodgers come see her at either the Red Cow Moran Hotel or Silver Springs Moran Hotel this Christmas.. The queen of Christmas is back with an all new comedy Christmas show at the Four Star Red Cow Moran Hotel Dublin. Celebrating her 20th year in show business, June has produced and directed an amazing Christmas Show, with all the favourite acts such as Jacinta O’ Brien and Elvis ‘in riiiaaaallttoooo’ as well as some new acts such as Lady Gaga and Elton John! 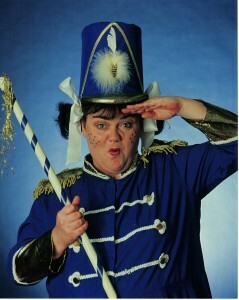 If it’s topical June has a great act! View June Rodgers recent interview on Ireland Am. If you are planning a Christmas Party Night with work or a Christmas get together with friends or family then the June Rodgers Christmas Show is an excellent choice. View a preview of this amazing Christmas Show! This Christmas Comedy Show starts on the 26th of November and runs right through to New Years Day with a matinee show inbetween on the 8th of December. 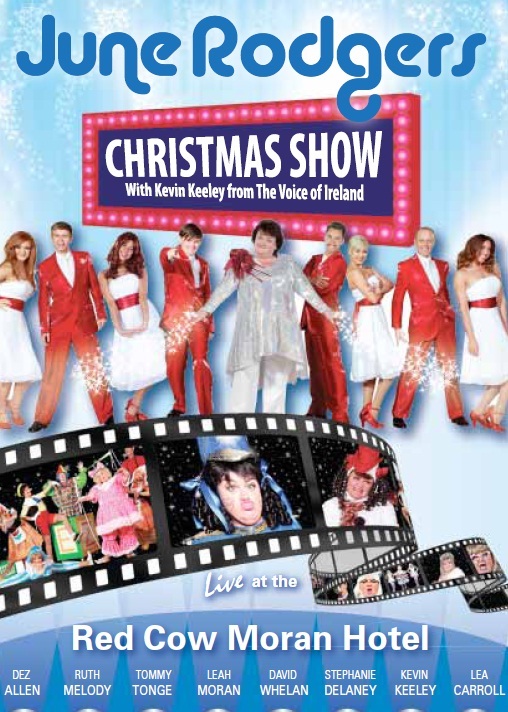 Prices are from €55 for a mouth watering 4 course meal and ticket to the show. If you want to make a night of it you can stay in one of Dublin’s best hotels– The Four Star Red Cow Moran Hotel from €95pps including a four course dinner, ticket to the show, accommodation and full Irish breakfast the following morning.